If you're a male and over the age of 10, you may want to skip this review, unless your looking to purchase a game for your sister, girlfriend or enemy. 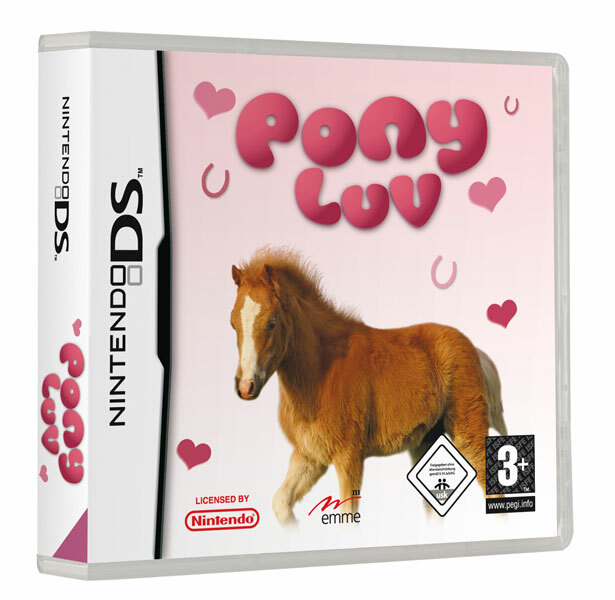 As the Nintendo DS has a name for being a "virtual pet" simulator, Pony Luv is no exception to the rule and allows the gamer access to 6 different breeds of ponies as they name, care and even race their animals. Keep him in top condition to win races! At its core, Pony Luv is a virtual pet simulator and before you start, you must first select one of six different breeds of ponies and then finally, name your new animal. In this virtual world, you can feed your pony, play with your pony, teach your pony and even dress up your pony. Another interesting aspect apart from grooming and feeding your pony is that there is a competition element of the title where you must enter your pony in a competition, provided you have taught them enough tricks. Definitely one for the girls. The game contains a variety of different mini-games to keep you entertained as you care for your pony and the most entertaining of the mini-game are the races. The game works well on the Nintendo DS, especially when you are using your stylus to interact. Our pony was called Brutus. The game also contains some simplistic icons to assist with your caring from feeding, toileting and sleeping to name a few. As a male gamer, I must admit that title is rather endearing and I'm sure female gamers of all ages will simply adore Pony Luv and for parents going away on holidays or long drives, this might be the perfect game to keep a youngster quiet. Where the title does shine is through the graphics that actually looks quite impressive on the DS, in this multi coloured cartoon way. The animals move with a real-world grace, although at times something does seem a little odd about the graphics. Sound effects, it's all pony here and the music suits the genre perfectly in this cutesy way. Verdict? Pony Luv is a game targeted for the younger female gamer so we cannot be too harsh when scoring this title. It does feature some great virtual pet scenarios and mini-games and if you're a parent with younger children with a DS (preferably female), than this might be the perfect Christmas present!